Who has time for a strategic account plan? You’re so crazy busy with Account Manager stuff that as far as priorities go, an empty inbox wins over strategy any day. Who can blame you? I mean clients aren’t calling you demanding their strategic plan, but they sure do pounce if you take more than 5 minutes to reply to their email. It’s so easy to get caught up in the daily grind and forget the big picture. As an Account Manager, you want to demonstrate to your client that you are optimising your partnership and leave absolutely no doubt they have made the right choice in doing business with your company. To do that, you’re going to need to dust off the strategy once in a while. Now before going on, let’s be clear on what I mean by strategy. It’s simply figuring out how to get from where you are to where you want to be, by the shortest route possible. It should have an impact. It might even be disruptive. It should change things for the better. There are quite literally hundreds of strategic planning frameworks that have been developed over the decades. For now, we’re going to ignore them all! This strategic planning guide is for the busy Account Manager who doesn’t have time to do a SWOT or PEST analysis. There are many ways to use this planning process, but for the purpose of this article, I’m going to assume you are designing the plan in collaboration with your client. So here’s my easy (in fact insanely easy) effective and quick strategic account plan. Arrange a 90-minute brainstorming session with your client dedicated to strategic account planning to answer the following 5 questions. It’s a great way to stimulate discussion and get the creative juices flowing. Don’t just focus on money. Financial benefits can take some time to realise. In fact, your strategy may involve spending, not saving money (i.e. upgrading products and services). What else is important to your client (and to you)? Let’s dive right in. No fancy equipment needed. Pen and paper, a whiteboard or your favourite note-taking app. You may also wish to record the session (with permission) on your phone or tablet for later review. What is going well and what isn’t? Did you get there through good luck, bad luck, good planning or no planning? How does performance compare to benchmarks? Think blue skies – what would drive the most value if there were no obstacles. Then group these into what’s realistic and what’s aspirational. This will help with prioritising. Don’t disregard the “someday” ideas – you’ll come back to them. What is the overall purpose or mission? What do you both want from your partnership? Are you happy or unhappy with the status quo? Is there are an appetite to do something totally different? Change the game? What is the biggest issue your client is facing? If there were no limits – what would you do? What new trends or technologies are emerging? Are you ahead or falling behind? 3) What changes have to be made? Compare the current state and desired state. What’s inhibiting you? What would it take to do things 10x better than you do now? What would create more opportunities? What do you need to stop or start doing? Consider alternatives. What’s your Options A, B and C? What are the quick wins? Sometimes a small change can have a big impact. 4) How should changes be made? Change won’t happen overnight. There are things you can do yourself which will deliver a fast result but generally, you’ll need to persuade other people to buy into your strategy. How are you going to get their support – intellectually and emotionally? Consider the who, what, when, where and how needed to make your strategy a reality. Should your focus be narrow or wide? What can you do for free and what will need a budget? 5) How should progress be measured? Don’t get too hung up on measurement. A rough and dirty figure is fine. This isn’t going to be audited by a team of forensic accountants. You want to demonstrate progress that brings your strategic account plan to life. You’re are going to end up with a huge amount of information and a big list of ideas which need to be translated into a strategic direction. In the Strategic Account Plan Template, there is a Whiteboard Worksheet where you can write these down if you wish. How likely is it that they will succeed or fail? Which are the needs vs. the wants? Is it time sensitive or urgent? Is it going to be easy or hard? Is the return on investment worth the effort? Those that are just never going to work, discard. Anything with a 1 is on hold (for now). Time and opportunity may make these worth revisiting so don’t abandon them entirely. So now you have strategic priorities, it’s time to put them into the strategic account plan. Make it clear what time frame this plan applies for. Is it a calendar year, a 6-month plan, a rolling 12 months or perpetual? You can introduce your strategic account plan at any time. You don’t have to wait until the beginning of the year. Start by assigning a category to every strategy. We’re going to borrow from the Balanced Scored and group our strategy into 4 buckets. Of course, you can have more (or less) but 4 is a good number that gives you diversity in your plan and focuses on other areas beyond the financial. It’ll also make it easier to communicate how well you’re doing. Here’s the 4 I use most frequently but choose any that’s relevant to you and your client. Here you enter your top strategies from the previous step (those with a score of 3). These will be the ones that you’ve assessed as the most impactful based on available resources and return on investment. They’ll also be the ones with a realistic chance of success. Some might be quick wins, others might be more mid to long-term. They all deserve a place on the strategic plan. Every objective need to define a target, and how it will be measured. 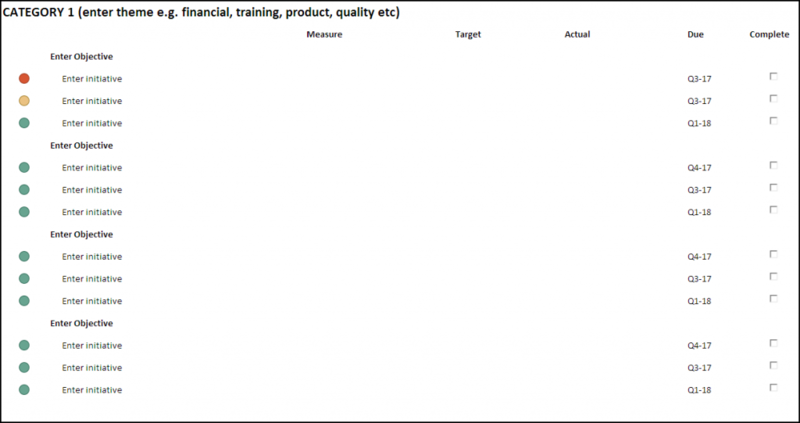 As with objectives, there needs to be a target and agreed measurement. It’s important to establish the frequency with which you and your client are going to review the success (or failure) of the plan. For large clients typically this will be quarterly. For smaller clients, it’ll be every 6 months. Be critical about what’s worked and what hasn’t. Be prepared to modify or even abandon some of your favourite strategies if they’re not working or if more important objectives have surfaced during the year. Your plan needs to be agile enough to respond to the current environment. When things are completed, tick them off the list – there’s nothing more satisfying. Strategic account planning is going to keep you focused, make you more productive and most importantly, demonstrate to your client the value you’re bringing so you have a really compelling story to tell about your partnership. Check out Mindtools list of 136 strategic planning tools (I told you there were hundreds!). It’s incredibly comprehensive and many of the articles are accompanied by videos. They also have a great YouTube Channel exploring leadership, management and strategy. After creating your plan, you need to launch it. This post guides you step-by-step on strategic implementation and setting your plan up for success.